My first experience in camping was in the 1960’s when my Dad rented a Nimrod Pop Up Camper from a local camper dealer and took the family to Morrow Mountain State Park in North Carolina. My father and I helping cook at a Good Sam campout. This was the “first” of many camping trips with my family growing up. I can remember looking out the screen window that first night, holding a flashlight watching out for the raccoons trying to get to our food that we had left on the picnic table. Man we learned a lot that weekend! Early days of family camping. During the next few years we had a couple travel trailers and a motor home. There was the trip to Nashville TN, and the one down to Florida where we went through a bad rain storm at night on the interstate and the rear window was leaking and my mom was hollering for help trying to stop the water coming in. The monthly Good Sam Campouts, potluck suppers and cooking the pigs over the open pits in the fall at Lazy Acres Campground in Fayetteville NC. I have many fond childhood memories from those times together with the family and it shaped who I am and where I am at. In 1993 Tammy and I purchased a new 35ft Citation travel trailer that we set up on a lot that my Mom owned on the ICW at Sunset Harbor NC. We enjoyed the next 18 years with our two children using the trailer while fishing, boating and kayaking in the area of Oak Island and the Lockwood Folly River. The only time that it was moved was a couple of times that we had hurricanes come into our area of the coast. Finally the air conditioner went out and between the expense of replacing it (which would have been more than the trailer was worth) and the desire that I had to get back to going to different places in a camper, I convinced Tammy that we needed to replace the travel trailer with a smaller one that we could pull and go camping in other places. Our start at seeking fun and sun. By this time, we were empty nesters and found a cute 19FT Passport travel trailer that had a queen size bed up front and one slide out. We figured this would be a great start and it was light enough that we could pull it with our Chev Tahoe. So we hit the road on the weekends going to different campgrounds in southeast NC and the Myrtle Beach area. After a couple of months I upgraded the Tahoe to a Chev 1500 4×4 truck. After about a year, we spent a rainy weekend at Myrtle Beach Travel Park and decided we wanted something bigger.We soon upgraded to a 24ft Cougar travel trailer and changed trucks to a 2500 Chev 4×4. We hit the road on the weekends for the next year enjoying the larger unit and floor plan. They say the 3rd time is a charm. Preparing for the future…… I always thought that a motorhome would fit our needs better than a travel trailer. I had read about folks parking in Walmart parking lots, rest areas etc and I liked the idea of being able to move from the driver seat to the bathroom or bed without having to go outside. I don’t know… it’s just the idea of staying over night in a Walmart parking and something happening that causes me to need to move quickly and not being able to get to the tow vehicle to leave dodge. So our current set up is a 32FT Windsport motorhome and a Jeep Wrangler that we tow. We have really enjoyed it, traveling across our great state, from the coast to the mountains and looking forward to expanding our travels further out west to see what’s out there to explore and experience. 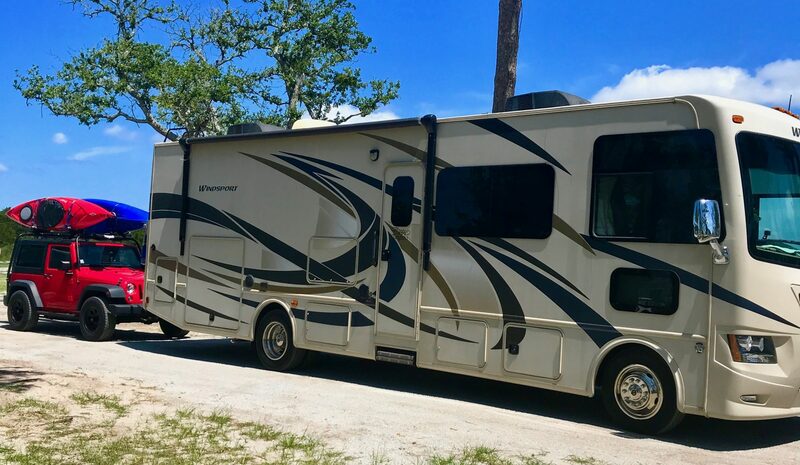 During the time that I have been surfing the internet learning all I can about traveling with an RV, maintenance issues and where to go I started reading “RV blogs.” I discovered that folks enjoy sharing there experiences, tips and advice and photographs. I have really enjoyed reading about all the adventures that folks are having. I also discovered different reasons that folks blog, some do it as a journal so that they can record there travels to different locations and what they did. Also a neat thing I learned was that it was a way that they were able to keep their families and friends posted on where they were and what was going with there travels. With that Fun and Sun Seekers blog has been created and I hope that you will enjoy our writing and photographs as Tammy and I “seek fun and sun.” It may not be all about camping, with living near the beach we do enjoy hitting the sand in the jeep, kayaking and fishing near home! And being that we both still work full time, most of our camping is limited to a couple hours out of home base. Day Trip to Spring Lake NC hitting a state park. One goal that I have set is to visit every state park in North Carolina and then hit as many National Parks and Forest as we can. Alot of these will be day trips in the jeep, but hey we will be using the motorhome too! I hope that you will follow along as we share our adventures as we seek fun and sun!